And all the other bikes - all of them - belong to my wife or the children. Well except for the rain bike. And you can't count the penny farthing because I was going to leave it in England and it was the children who made me keep it for when they're big enough. And the one that we keep for visitors but that's for visitors. And the Brompton - Juno Watt, it's my wife's Brompton and she blames me for buying it. And she nicked the mountain bike that I had bought for myself, a perfectly good gentleman's mountain bicycle and she despite, or because of, not being a perfectly good gentleman, simply said 'Thanks' and got on it and made me adjust the saddle for her, the horrible witch. 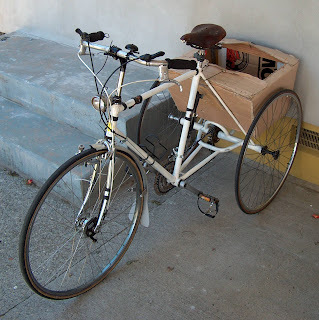 And the tandem's half hers. I mean what use is a tandem if there's only one of me? So she's a dissembling lying git saying I have enough bikes. But then she always does this. 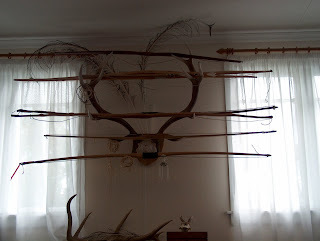 She said I had enough longbows when I was a longbow person, carefully scraping six-foot lengths of ash and elm and lemonwood and osage orange and yew, delicious sweet-smelling yew that eventually poisoned me and now makes my nose seep blood if I start scraping it. I had hardly any longbows. She said I had masses. She said Was I trying to corner the market for when there was Peak Gunpowder. Hardly any longbows. Almost none. Well there *are* a few more on the other wall, and some propped up between the wardrobes, but that's still hardly any. And now Mr Gillions is on at me to go and buy that lathe from Invercargill but he doesn't care that I've got a wife who will make Peak Lathe remarks. So I shan't. I shall buy a shaper instead.